Following sold-out grassroots screenings and a theatrical release in June 2011, THE BEST AND THE BRIGHTEST, a new comedy directed by Josh Shelov and co-written by Shelov and Michael Jaeger, makes its way to VOD, digital platforms and DVD on August 16.. Featuring an all-star cast including Neil Patrick Harris (How I Met Your Mother), Bonnie Somerville (The Ugly Truth), Amy Sedaris (Strangers with Candy), Christopher McDonald (Harry’s Law), Kate Mulgrew (Star Trek: Voyager), John Hodgman (The Daily Show with Jon Stewart), Peter Serafinowicz (Couples Retreat), Jenna Stern (Game Change) and Bridget Regan (Legend of the Seeker), THE BEST AND THE BRIGHTEST offers a refreshingly “adult” twist on contemporary parenting.. Compared by Movie City News to A Fish Called Wanda and Ruthless People, THE BEST AND THE BRIGHTEST is a modern-day farce set in the world of New York City’s elite private schools. 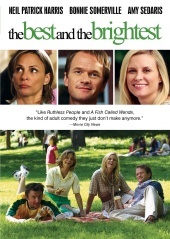 The Jasinskis (Harris, Somerville) are a middle-class couple from Delaware who move to New York City with their five-year-old daughter for a last chance at “the big time.” Upon arrival, they experience a big problem: they can’t get their daughter into a single private kindergarten. The couple desperately turns to kindergarten consultant, Sue Lemon (Sedaris), who recommends Jeff pose as a high-profile poet to gain kudos from the VIPs (Hodgman, McDonald and Mulgrew) who are deciding between two child candidates for the last coveted slot at Coventry Day School..